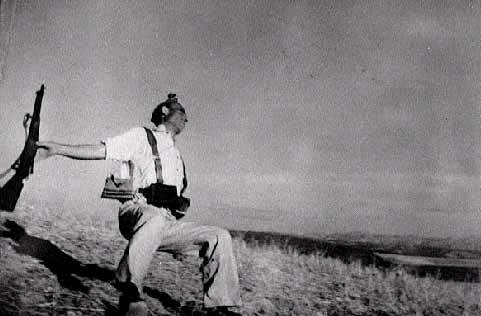 I see that Robert Capa's Lost Negatives from the Spanish Civil War have been found. Having recently finished The Battle for Spain, I can't wait to see what comes from them. Lets hope this wasn't his "ones I got wrong" box! It's quite a surprise to me the huge influence this little blog can have. First I wax lyrically about how much I like my lensbaby and what happens? Mr Lensbaby himself, Sam Perdue, comments on my blog! Then I create a check-list for photographers and what happens? Microsoft decide it's such a good idea they want to copy it. But now, no sooner have I waxed lyrically about how wonderful craghopper furry trousers are but they need a leg pocket, when what happens? Through the door comes a parcel containing some of the very same trouser but now with the requested pocket! Hmmm, I think I best only use these powers for good. I'm slowly working through my jobs to do list and have got round to updating some of my galleries. Please take a look at my updated 2007 portfolio and London Light/London Life galleries, hope you find some images their that you enjoy. I have had a couple of mails from people trying to use my Limited Edition Management System (LEMON) on Access97 and failing miserably. For these poor souls I have created LEMON for Access 97, I hope you find it of use. Photographers rights are a recurring theme on this blog, but being from the UK almost all of the information has been about UK law. I have noticed that Attorney At Law Bert P. Krages II has an excellent one page downloadable PDF about photographers rights which should be of use to my American Friends. One of the regular complaints about Capture One V4 is the way it fills up your various directories with its cache and setting files. Personally I have no need to archive or back these up so I wanted a way to remove them from all the sub directories in one go. In the end I came up with the following solution - but it only works for windows users so you chaps with nice shiny Macs will have to use something else...sorry! FOR /R "c:\Working" %%a IN (CaptureOne) DO RMDIR /S /Q "%%a"
Save the file as C1.bat on your C: drive. Now when you double click on c1.bat in Explorer, all the Capture One temporary files will be removed as if by magic. So here in the Northern Hemisphere it is winter. Though with climate change it can be a little confusing as some days can be very warm.... but stand by the coast before the dawn comes up and you know it's winter. So my current favourite bit of equipment is not a camera or accessory but a pair of trousers! The Craghoppers kiwi fleece lined trousers are a god send this time of year. On a cold winters morning fleece is your friend and combined with a practical outer shell they are perfect for standing leaning on your tripod and wondering if the sun will ever come up. The slightly baggy fit is ideal for those really cold mornings when you need thermals underneath. I love em, if only they had cargo pockets to put your filters in like the standard Kiwi trousers do, they would perfect. Highly recommended to keep your uglies snugly. Well It seems I have now been blogging for a whole year, and what an adventure it has been. When I started I got excited if I had more than 3 visitors to my site a day, now I get disappointed if the daily visitors drop below 150 and amazingly 400 of you think that my random ramblings are worth subscribing to! A huge thank you to all of you who read this stuff. Those of you who comment and send me emails about the blog are much appreciated too. So what have we learned over the last year? Lots of people want to know how to get a paypal shopping cart in their web galleries. Quite a few are interested in using a controlled vocabulary. and loads are interested in mounting and framing their pictures. I try to keep this blog fresh by leaping from the technical, to the humorous, to the philosophical to the just plain ranting. Hopefully I will be able to keep up the standard for 2008. I wish you all a very happy 2008. Sheffield based photographers Martin West and Martin Levers produce some very beautiful landscapes. As the name of their website (peak-light.com) suggests they spend a lot of time photographing Britain's most visited National Park - The Peak District and really manage to convey the beauty of the place. A visit to their website is time well spent.